Is that the professionalism of these "people"...?????????? Why MACC still "not" investigating the "Toyol Istana".....???????? That...! My friend, is "clear" daylight robbery...!!!!!!!!!!!!! Why our PM also not "slapping" Toyol's hand...????? Actually should set up RCI on themselves........!!! 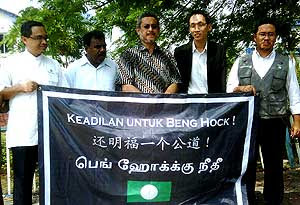 i) yb, watch out for some 'friends' within your own party. u know who i am talking about. just be careful with them. ii) what can we, the common rakyat, do to help? iii) i am very pragmatic. just publish a bank-account and put a cause to it. u will be 'brave' selangorians chippin in. especially the 'takut hal' chinese. they got money, them chinese in selangor. iv) cannot play by the rules anymore with evil-umno and its minnions macc, police, ag chambers, judiciary. play dirty with them. we understand. i repeat, cannot play by the rules anymore. all govt machineries are with evil-umno. but people of selangor are solidly behind pakatan. They were defending the unjust and showing partiality to the wicked. Have eyes but cud not see , as good as blind. Kita mesti terus menentang BN/UMNO sehingga mereka jatuh. Dengan bantuan ALLAH dan usha gigih yang berterusan dari semua, insyaALLAH rakyat akan berjaya. So tired of the UMNO lies, corruption and suppression of the rakyat. Their newspaper paints the Indians as petty criminals, Chinese as gangsters/crime lords and religious Malays as terrorists, ALL deserved to be locked up under ISA! It is UMNO warlords who are the crime lords, who dictates how much goes to who when the govt disburses contracts, It is the UMNO putras/putris who are the petty criminals, with the Mat/Minah Rempits leading the pack. I have never seen so many blonde Malays, except in the UMNO meetings. They selectively choose when to call themsleves Muslims, while they steal, rob, molest who they wish and drinks liquor on a daily basis. I say we defend the S'gor govt and don give the accusations any attention until the next GE when we throw UMNO out of the Federal govt. But we can only do that if PAS don get into anymore Unity Govt talks. The educated people realy want to throw out the UMNO goons, and if PAS hands over the life-support to UMNO, they will split the country in half. And with UMNO's expertise at cheating, they will sit back at Putrajaya. Boleh ke sebagai seorang Islam membuat tuduhan secara melulu?